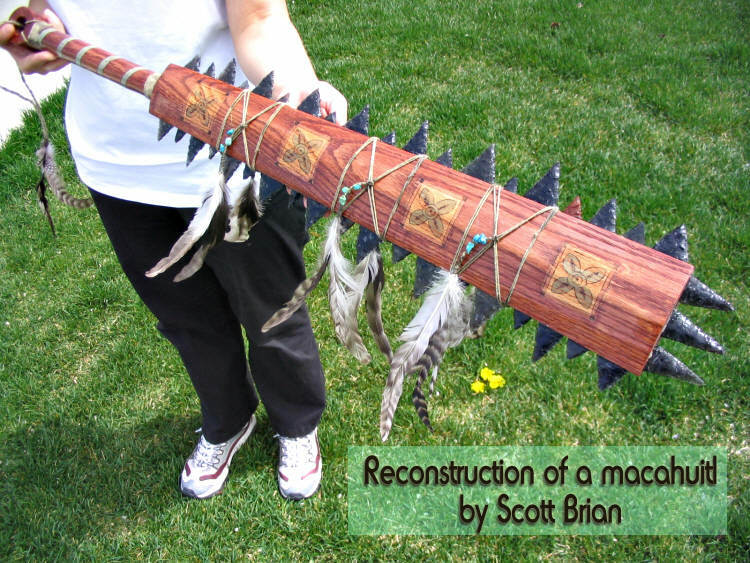 Matthew Roper: "the Mesoamerican weapon the macuahuitl fits the criteria for the Book of Mormon "sword"
Question: Should we expect to find ancient swords in either the Old World or the New World? Macuhitl sword from Richard F. Burton, Book of the Sword (London: Chatto & Windus, 1884). Public domain image (copyright expired.) 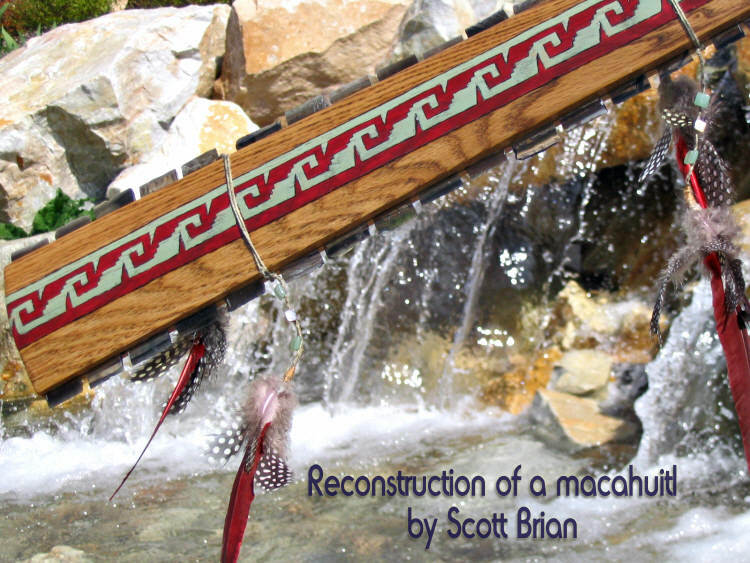 Originally obtained from: http://en.wikipedia.org/wiki/Image:Macahuitl.png. Caption from original work reads: "Mexican sword of the fifteenth century, of Iron Wood, with Ten Blades of Black Obsidian Fixed Into the Wood (This weapon is twenty-five inches long.)" For an archaeologist to find swords or other weapons in the Old World (the ancient Near East) is very unusual. As a matter of fact although hundreds of times as much archaeological digging has been done in the Near East as in Mesoamerica, finds of Near Eastern weapons of any type are rarely made. The obvious reason for that is that the kinds of places archaeologists excavate (e.g., temples, elite houses, public buildings) are not where weapons were kept or left anciently. As a matter of fact, there was little or no reason to intentionally leave a perfectly good weapon anywhere. It would be passed on to another person/warrior, or if left unintentionally it would be salvaged by the first person to find it. The same would be true in Mesoamerica (where metals were even more rare than in the ancient Near East), or anywhere else. How we learn the most about weapons in antiquity is from art—if the artist happened to depict a battle scene or armed warriors. At present, no archaeological evidence for swords of steel (or any other metal) exists in America from Pre-Columbian times. There is now evidence for steel swords in the ancient Near East (something that critics long denied). So, even in the ancient Near East—where the conditions are more suited to preserving artifacts, and much more archaeological work has been done—the identification of steel weapons is recent. Question: Are all swords mentioned in the Book of Mormon made of metal? The Book of Mormon does indicate that at least some swords were made of metal, specifically, "steel." Some Jaredites are described with steel weapons (see Ether 7:9), and Mosiah 8:11 mentions Limhi's explorers finding the remains of Jaredite battles with blades that have rusted, suggesting that they were metallic. Nephi1 also acquired an Old World steel sword from Laban (1 Nephi 4:9). Critics make the unwarranted assumption that because some weapons—generally used by elite leaders—are described as being made of metal, we must therefore conclude that all Book of Mormon swords were made of metal. In fact, what the Book of Mormon suggests is that some of the elite among the Jaredites and the Nephites had metal swords at certain times, but most swords and armor were not made of metal. Steel swords were exceptional and rare (and, because they were unusual, such weapons were mentioned specifically by the Book of Mormon authors). Jaredite swords: "the blades thereof were cankered with rust"
The earliest reference to steel swords in the Book of Mormon is in a passage recounting the notable deeds of Prince Shule. Shule is described as "mighty in judgment" (Ether 7:8). We are told, "Wherefore, he came to the hill Ephraim, and he did molten out of the hill, and made swords out of steel for those whom he had drawn away with him; and after he had armed them with swords he returned to the city Nehor, and gave battle unto his brother Corihor, by which means he obtained the kingdom" (Ether 7:9). Note here that Shule appears to be the one with the knowledge and skill to do this. "He did molten," he "made swords out of steel," "he . . . armed them." Did he pass this remarkable skill on to others? The passage does not say. It is interesting, however, that the next generation is nearly wiped out (Ether 9:12) and that there is no further mention of steel in the Book of Ether following this episode. Is this an indication that steel technology among the Jaredites was subsequently lost? In periods of social anarchy, valuable possessions tend to be stolen and lost or destroyed. They couldn't keep them (Ether 14:1; Hel. 13:34). The other passage bearing on the question of Jaredite swords is the one describing King Limhi's search party. Although, they did not find the land of Zarahemla, the search party found ruins of buildings and bones of the Jaredites along with the 24 gold plates of Ether. "And also they have brought breastplates, which are large and they are of brass and of copper, and are perfectly sound. And again they have brought swords, the hilts thereof have perished, and the blades thereof were cankered with rust" (Mosiah 8:10-11). We are not told if the blades were of steel or some other metal which can rust. The search party brought back the plates and the breastplates and the rusted sword blades "for a testimony that the things that they had said are true" (Mosiah 8:9). The fact that they brought the breastplates and rusted sword blades back to Limhi suggests that metal blades and breastplates of copper were rare or unusual. Nephi, writing decades after these events, still considered Laban's steel blade to be "most precious"
After separating from the Lamanites, Nephi states, "And I, Nephi, did take the sword of Laban, and after the manner of it did make many swords, lest by any means the people who were now called Lamanites should come upon us and destroy us" (2 Nephi 5:15). Nephi also indicates that he taught his people various skills which included, among other things, working in various metals and some form of steel working (2 Nephi 5:15). One way to read this is that Nephi made other steel swords. It should be remembered, however, that steel working is a difficult and multifaceted process. Nephi's knowledge of steel may have meant he was skilled enough to make long steel sword blades, or it could simply refer to steel ornamentation. It is interesting to note that Nephi, writing decades after these events, still considered Laban's steel blade to be "most precious" (1 Nephi 4:9). What made Laban's blade "most precious" decades after Nephi made swords for his people? Is this an indication that Nephi's skills with steel, whatever they consisted of fell short of making long steel blades? Another way to read this is that Nephi made swords after the general pattern of Laban's sword—that is, as a straight shaft with sharp blades along both edges, rather than a one-sided sickle sword which was also common in the ancient near East. The minimalist and tightest reading of this evidence is that Nephi had a steel weapon from the Near East. He attempted to imitate this weapon-whether in function, form, or material is unclear. His descendants apparently abandoned this technology by no later than 400 B.C. Based on a careful reading of the text of the Book of Mormon, there are no grounds for claiming-as anti-Mormons repeatedly do-that the Book of Mormon describes a massive steel industry with thousands of soldiers carrying steel swords in the New World. Question: Did the use of metal swords mentioned in the Book of Mormon persist? If we suppose that Nephi made other steel swords, need we assume that all subsequent Nephite swords had blades of steel or other metal? To how many Nephites did Nephi pass on the knowledge of working in steel? Did all Nephites know how to work steel or just some? The last reference to steel among the Nephite is during the time of Jarom (Jarom 1:8). After that, steel is never again mentioned among the Nephites. When the Zeniffites return to the land of Nephi a few generations later, they work with iron and other metals, but not steel. This, perhaps not coincidentally, is the last reference to Nephite "iron" (Mosiah 11:3,8). One has to wonder if some of these early skills were lost. It was apparently an exceptional thing for Nephi or Benjamin to wield the sword of Laban in the defense of their people (Jac. 1:10; Words of Mormon 1:13). Why would this be necessary for a king if steel technology was commonplace and well-known? This again, suggests that steel swords were the exception not the norm. By way of historical analogy, in many rural villages in places such as Asia or Africa, one family of artisans might supply the metallurgical needs of thousands, yet the ferrous skills possessed by those few could easily be lost in just one raid. It seems reasonable to suggest that a similar situation occurred among the early Jaredites and Nephites in ancient Mesoamerica. In a recent study of North American copper pan pipes, one scholar attempted to explain why certain copper technologies, if once available in North American Middle Woodland cultures, were not passed down to subsequent groups. She reasoned, "The technological information must have been restricted to a limited number of individuals and artisans. Following the disruption of the interaction sphere, this information in the hands of so few artificers and entrepreneurs was not passed on and was consequently lost. There was no retention of that knowledge and when, half a millennium later new societies developed, it was with new copper techniques and new artifact styles." In the absence of archaeological evidence for metal weapons in early Mesoamerican times, it is worth remembering that there is linguistic evidence, noted by John Sorenson, for metals in Mesoamerican antiquity dating back to Olmec times. When this is coupled with the interpretation of the rarity of metals swords mentioned above, the issue is much less problematic when additional perspective is added. Question: Did swords exist in Pre-Columbian America during the Book of Mormon time period? Some critics have charged that no Pre-Columbian swords existed at all. This is clearly false; evidence from Pre-Columbian art supports the idea that there were swords as early as the Pre-classic. Non-LDS authors have often used the term "sword" for such weapons. 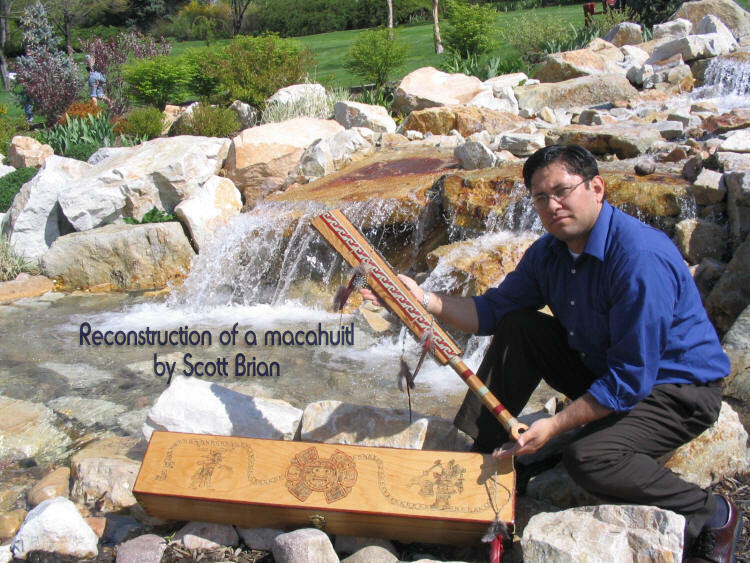 Scott Brian, a graduate student of Archaeology at BYU, has made several reconstructions of a macuahuitl, the ancient Mesoamerican weapon often termed a "sword"—the term the Spaniards used when they faced this fearsome weapon that could cut better than metal swords. Some Book of Mormon passages make less sense if the reference to "sword" is read as a European-style, metallic sword. Obsidian gleaming in the light. From R.Weller/Cochise College, free for non-commercial educational use. Original here. ↑ Yigael Yadin, The Art of Warfare in Biblical Lands 1:10—11. ↑ Claire G. Goodman, Copper Artifacts in Late Eastern Woodlands Prehistory, edited by Anne-Marie Cantwell, (Evanston, Illinois: Northwestern University Center for American Archaeology, 1984), 73. ↑ Diego Durán, The History of the Indies of New Spain, trans. Doris Heyden (Norman: University of Oklahoma Press, 1994), 66, 76, 109, 135, 139, 150, 152–53, 171, 198, 279, 294, 323, 375, 378, 412, 428, 437, 441, 451, 519, 552–53; Diego Durán, Book of the Gods and Rites and the Ancient Calendar, trans. Doris Heyden and Fernando Horcasitas (Norman: University of Oklahoma Press, 1971), 124, 178–80, 234, 236; The macuahuitl "was equivalent to the sword of the Old Continent"; Francesco S. Clavijero, The History of Mexico, trans. Charles Cullen, 3 vols. (Philadelphia: Budd and Bartram, 1804), 2:165. Cited in Matthew Roper, "Eyewitness Descriptions of Mesoamerican Swords," Journal of Book of Mormon Studies 5/1 (1996): 150–158. off-site PDF link wiki See footnotes 4-5. ↑ Over a dozen examples are cited in Matthew Roper, "Eyewitness Descriptions of Mesoamerican Swords," Journal of Book of Mormon Studies 5/1 (1996): 150–158. off-site PDF link wiki This example comes from Bernal Diaz, The Conquest of New Spain, trans. J. M. Cohen (New York: Penguin Books, 1963), 145.